The Sigma 150mm f2.8 EX DG OS HSM Macro Lens features the latest optical technology. A floating focusing system moves two different lens groups in the optical path to different positions and compensates for astigmatic aberration and spherical aberration and provides extremely high optical performance from infinity to 1:1 Macro. 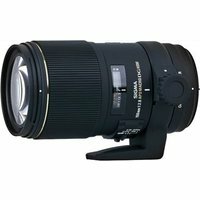 Equipped with Sigma's proprietary OS (Optical Stabiliser) function, the 150mm f2.8 EX DG OS HSM Macro Lens offers the use of shutter speeds approximately 4 stops slower than would otherwise be possible.